Travel guidebooks have made this image the symbol of Bhutan. One of the most holy sites in Bhutan, the Guru Rinpoche (see the photo of the thondrol in the Paro Festival series) is said to have flown here on the back of a tigeress and then meditated in a cave, contained within the present structure, for three months. 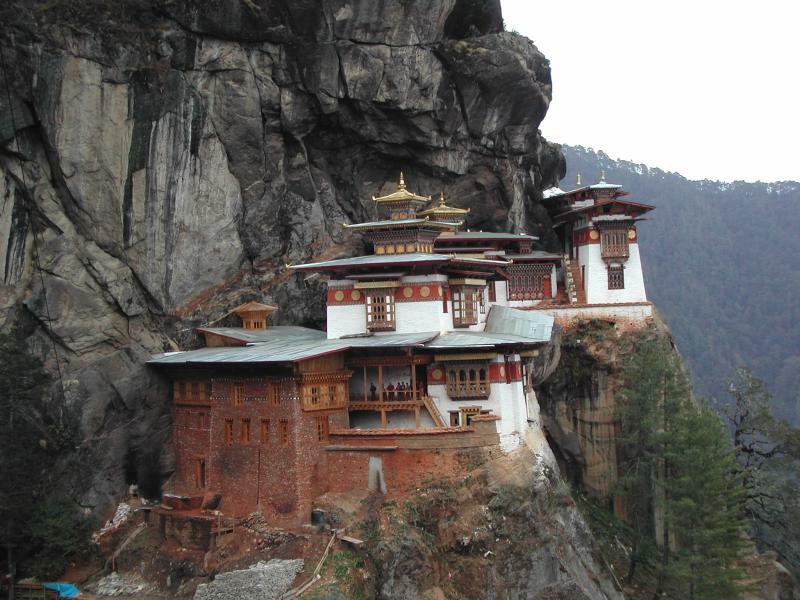 The monastery (goemba in Bhutanese) was built in its present form in 1692. It suffered a devastating fire of unknown origin during the night of April 19, 1998. Speculation is that the fire was caused either by lightening or an overturned butter lamp. Old photographs and diaries were used to make the reconstruction as close to the original as possible, though there was little documentation of the wall paintings and other artwork housed inside. Special permission is required for non-Bhutanese to visit the monastery, usually granted only to practicing Buddhists on a religous retreat. This photograph was taken from the viewpoint across the valley, the furthest point ordinary tourists can reach before being stopped by a guard.